Background: Phycobiliproteins are located in phycobilisomes, which are huge pigmentprotein complexes that function as light harvesting antennas for photosynthesis in cyanobacteria, red algae and other uncommon species. Methods: The research progress of structures of the pigmented-covalently-binding phycobiliproteins were reviewed, including PhycoCyanin (PC), AlloPhycoCyanin (APC), PhycoErythroCyanin/PhycoErythrin (PEC/PE) and linkers. In addition, the progress of their combinational biosynthesis was also visited. 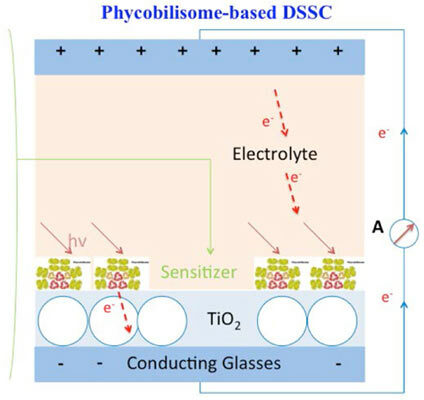 Results: We summarized advances in the development of phycobiliproteins-Sensitized Solar Cells (Dye Sensitized Solar Cells, DSSC) with high photoelectric transfer efficiency and low cost. Meantime, the efficiencies were compared on phycobilisome-based and bacteriochlorophyll/ chlorophyll-Sensitized Solar Cells. It was also discussed that directional molecular design of phycobiliproteins, for artificial high-level structure. Conclusion: To accomplish higher level assembling of in vitro synthesis of phycobiliproteins requires technology for multichromophore attachment to apo-phycobiliproteins, and an understanding of linkers’ function in high-level phycobilisome assembly. Phycobiliproteins, artificial photosynthesis, energy transfer, Dye -Sensitized Solar Cells, lyases, phycobilisome. Yantai Institute of Coastal Research, Chinese Academy of Sciences, 264003, Yantai, China.